The purpose of this page is to create a ring of web pages devoted to Canada's number one rock band, The Tragically Hip. A Web Ring is a ring of topic related sites that can be interconnected by simply adding a little bit of hypertext code to your page. This is much simpler and cleaner than adding hundreds of links to related sites. By using a ring, there is one link that you click to move on to the next related site. I handle all of the processing. You just add the codes. You are assigned a number, or "site ID", upon registration. This identifies you to the Tragically Hip Web Ring, and allows me to locate the next site on the ring, as well as the previous, and so on. The concept is very simple and will allow all of the Tragically Hip sites to become easily accessible, without the use of search engines or other web navigation tools. More information can be found at the WebRing home page. 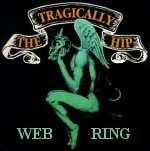 The Tragically Hip Web Ring was founded by, and is maintained by Jeff Aycan.